An Australian publisher has had to pulp and reprint a cook-book after one recipe listed "salt and freshly ground black people" instead of black pepper. The Ash Cloud That Ate Northern Europe! I was interested when story of the Icelandic volcano first broke a few days ago, but I've become so attuned to "natural disaster" stories that I wasn't prepared for it to still be going on half a week later. It's usually earthquakes, tsunamis, tornados: one big violent blast and then it's time to piece up the pieces and rebuild. But to have northern European airspace closed for three days, and read that it could just as easily go on for another week - two weeks, who knows? That sort of slow-motion nature story isn't that common. Even a hurricane has a long buildup but a relatively quick resolution. Today I read that Prime Minister Harper is not going to be able to attend the funeral of the Polish President in Krakow - just too difficult to get there and back in the time frame. I don't fault anyone for being cautious; volcano ash is very dangerous to airplanes, as the following dramatization/documentary shows. It's from one of my favourite TV shows, "Mayday", which is a Canadian documentary series about air disasters. It's been marketed abroad under the title "Air Crash Investigation", but it's the same show. This program is one of their best; it portrays the case of British Airways Flight 9 from Kuala Lumpur to Perth in 1982. It passed through a volcanic ash cloud while flying over Indonesia, and all four of its engines became choked with the sediment and flamed out. The plane was very nearly lost in the Indian Ocean, but a combination of excellent flying skills on the part of the crew and an amazing chemical reaction managed to save it. This is the entire "Mayday" episode, with just a few slight differences from the Canadian TV version and the replacement of the narrator with one with a British accent; I assume this was made for the UK market. Anyway, it's an excellent series, and this is one of their best episodes. My crummy week started exactly a week ago today, with a sore throat right in the middle of gloriously record-breaking warm Easter weekend weather. The sore throat is still with me today, and has added its friends Stuffed Sinus and Plugged Ears. Yes, I have a fully congested head cold, and just as happened a few years ago, it has gotten bad enough to cause me partial hearing loss in BOTH ears this time. While the cold was gaining hold, I was struggling to finish the subtitles for "Sortilèges", to the point where I think I pushed myself too hard. To complicate matters, I couldn't use my familiar and beloved Divx MediaLand Subtitler, because the film wouldn't play in it! I'm not sure why - the best guess I can hazard is that there was an MPEG 4 coding embedded in it. The movie played fine in my Divx player, and I burned a perfectly good dvd of it, but when I tried to play it in Windows Media Player - nada. DMLS is designed to work with WMP, so maybe this movie was made using a Mac or some weird European program, but the end result was I had my subtitles all written out and ready to go, and couldn't play the movie. I pottered around for a few hours, trying to download codecs that would make it work, but finally I abandoned that haphazard job and decided to try a fresh approach: I downloaded a completely different subtitle program other users had written about, called Visual SubSynch, and launched myself on a quick and dirty tutorial. VSS *worked*, which was all I really cared about, and it's an interesting program that I might use again, although it takes a lot longer to use than DMLS. How it works is by ripping a .wav file of the movie, and then you attach each subtitle to the correct moment in the audio file, using the visual "graph" of the audio file to guide you as to where the dialogue falls. It produces a very high level of accuracy in terms of timing -once you've chosen your slice of audio and plugged in the text, you can shorten or lengthen the passage as much as you like, and you can shave hundredths of seconds off a subtitle length. This can be important when you have to subtitle fast dialogue exchanges, and need to squeeze many lines in quickly. The only problem I can see is subtitling "inserts": text that appears onscreen, like a closeup of a sign or a letter. There's nothing in the audio to tell you what's onscreen, and you'd have to learn to memorize the background music to tell you when the text is onscreen. I only had to do that once, when the title came onscreen. This program would be utterly useless for subtitling a silent movie, but for very talky films, it's quite good. Well, I finished on Wednesday, and now I have to wait for my hearing to clear up before I tackle Pabst's "Mademoiselle Docteur", which is what I've promised to do next. I'm afraid this cold is going to be a long one; my partner at the library had it, and she said it took her 3 weeks to get over it! Some of the kids in my bus have been sick (and their mothers WILL send them to school) so I probably got it from them. All I've been able to do is drive my route, come home and go to sleep until it's time to drive in the afternoon. I am totally wiped out. Oh, and my school van conked out yesterday, too. I was worried that the brakes (or maybe the wheels) were making a strange groaning sound and vibrating when I used them at low speed - very much the same feeling as when you're braking on an icy road, and just do a tiny skid before stopping. I called in to report this, and they said they'd send another driver with a different van to swap with me at the first school I stop at, and they'd take it in and look at it. When I was one block from the school, the engine suddenly conked out too! Fortunately a man came out of nowhere and got it started again, and I was able to struggle on to the school, but that sure started my day off in a miserable way. I hope they figure out BOTH the problems with the van; I'm quite useless in terms of fixing any problems myself. One good thing happened, though: it was so warm last week, I planted a row of peas. This must be a record for Ottawa; usually I wouldn't think of it until well into May, but I figured why not take a chance? Especially as they're predicting a hot summer, which means they won't have a long growing season. They're not above the ground yet, but I expect I'll see them in a few more days, then I'll plant some more, for a more staggered crop. The other day, I was doing my usual volunteer shift at the used bookstore/coffee shop we run in our local library. I do the setup, and my partner comes in an hour later. I'd put out the chairs, wheeled out the book racks and set up the cash register, so as the coffee was brewing, I turned my attention to some boxes of books sitting on the floor. Now, we get donations of books all day long. Some of the books we sell are library discards, but by far the greater number - probably 90% - are straight donations from the public. Our little shop has no storage room, so when people bring in books we mostly put the boxes on the floor near the coat closet (slightly blocking the hardcover French section, but not too many people are interested in those books anyway). Most every morning I come in to find a few boxes of books sitting there, accumulated from the previous afternoon. They wait there until the sorters come along - these are ladies who make the decisions which books to store at the back of the library (in their storage room), which to put out on the shelves, and which to put into the "Free" bin. Those are books that are marked up and a bit shabby, but still readable. They go in with the magazines, and people are welcome to take them for free. This time, I found two boxes of books over by the Classic Literature section, and they each had a label on them: "Damaged, Moldy Smell, Spines Broken - Please throw away". I opened them up and found a varied lot of rather old books, some of them in very nice condition, others a bit ratty looking, but all of them what I'd call salvageable. I could detect a slightly musty smell, but not very bad, and I have an extremely sensitive nose - if I think an odor is faint, most people wouldn't notice it at all. None of the books was water damaged; any "moldiness" was probably due to having been stored in a basement or attic, or it could even have been just the box that smelled a bit damp. Anyway, I rebelled at the order to destroy these books. I looked through them to see if there were any I could rescue myself, and then I put the rest in the Free Bin. If someone had said throw them out, I didn't feel right about selling them, but I felt they deserved a chance of life if someone wanted them. The ones I picked out were rather interesting: there were two books for kids about the history of the Mounties, and then there were two young readers adventure books featuring "Dale of the Mounted", written by Joe Holliday. I looked up these books on abebooks.com when I got home, and I discovered that there was a series of 12 of them, written between 1954 and 1964. They were all-Canadian adventure stories, and I'd never heard of them. "Dale of the Mounted: Atomic Plot" is dedicated to the workers at the nuclear facility at Chalk River, Ontario - rather poignant, as Chalk River just closed down last year. The synopsis on the dust jacket promises a story about spies and nuclear secrets. From the moment Pakistani scientist Dr. Sachi Rami gets out of the plane at Ottawa's Upland airport with his bodyguard the bearded, turbaned Chaudri, and his shy Hindu secretary, Kalomé, trouble dogs his footsteps. When I read this to Dean, he marvelled at how broad-minded the protagonists were: a Muslim scientist, with a Sikh bodyguard and a Hindu secretary, only a few years after they'd all been killing each other over Partition! 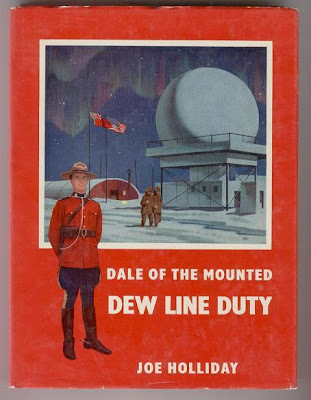 "Dale of the Mounted: Dew Line Duty" particularly interested me, because my Dad worked on the Dew Line when I was a kid. If you don't know, the Dew Line was a series of radar stations built in the high Arctic to detect foreign (i.e. Russian) attacks on North America over the polar ice cap. One of my favourite MST3K episodes is "The Deadly Mantis", because about a third of it takes place up on the Dew Line. I always wish my Dad were still alive when I'm watching it - I'm sure he'd have found it hilarious, and I'd have been able to ask him how accurate the details in the movie were. Was there really a giant "Have You Checked Your Antifreeze?" sign right outside the CO's office? Most of the refugees had come from Budapest. It was now a city of ruins, the aftermath of their terrible, but unsuccessful, revolution against their oppressive Communist masters who had systematically ground the people beneath brutal, ruthless military heels. Yeah, good stuff! And that's just on the first page! Dale's jaw tightened. "You tell these people," he informed the interpreter, "that this is Canada. I know they've had a rough time in Hungary, but in this country they've got to obey our laws, our way of doing things. Tell them I'll take charge of this man. We will check on his background, to satisfy ourselves about his record. Lynching may be okay in Budapest, but it isn't in Montreal." Today, making such a speech could very likely land a citizen in front of a Human Rights Commission. In 1959, everyone understood what it meant when someone said, "In this country they've got to obey our laws, our way of doing things". But today? What are "our laws"? What is "our way of doing things"? It's a permanent state of flux, awaiting the next band of aliens who can squat their butts down on Canadian soil, and immediately claim the right to remake "our laws" and "our way of doing things". Canada is not a permanent place; it's just clay waiting the next set of hands who can grab it and mould it into something new. Hunting Jews with machetes wasn't "our way of doing things" in 1959, but bring in enough people who like to do that and sure enough, now it is. Murdering daughters for wanting to drive wasn't "our way of doing things", nor was importing child brides or having multiple wives at public expense, but guess what? If enough people who feel like doing those things can get a toe in the door, before you know it all those backward, worthless traditions have also become "our way of doing things". Whatever "our way of doing things" is today, you can bank on the fact that by next year it will be different. It reminds me of a line from an MST3K movie: as the zombie steadily advances on the police, they shout "Stop where you are!" "I can't, I'm not there anymore," is the riposte. In the same way, Zombie Canada keeps mindlessly lurching forward into a void with no clear idea of where we came from or where we're going, just the certainty that we can't stop moving.